Spot prices saw a rise yesterday as lower renewable energy production is expected for today and temperatures are expected to be colder. Near term contracts were still showing a bearish trend yesterday as French hydro production was at a record high and Germany's thermal and nuclear generation was also high. Day-Ahead gas closed at 66.85ppt as gas contracts made losses across the curve, Front-Month fell by 0.6ppt due to the long system and an ease in supply concerns thanks to LNG deliveries. Langeled flows dropped by 16mcm but there were increased flows at the Bacton terminal which prevented any rises in contract prices. Seasonal contracts were bearish and reflected the prompt market with Winter-14 falling by 0.25ppt. 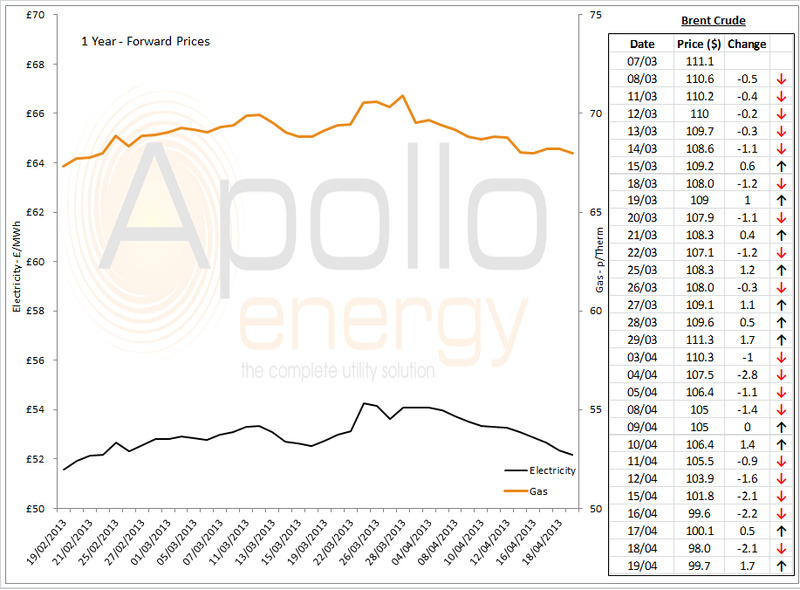 Day-Ahead showed no change and prompt power contracts had similar losses to the gas curve with July-13 showing the largest fall closing £1.25/MWh down. The majority of contracts along the far curve displayed no change. Gas contracts saw a rise even though storage levels are improved and temperatures are warmer, all except July-13 which fell by 0.65ppt. The market evened out across the curve this morning with Brent prices showing a gain and Spain paying off more debt than anticipated. Power contracts reflected the gas curve with an improving carbon market and a bullish outlook on the wider fuels complex. May-13 was the exception in rising contracts as it dropped by £0.20/MWh thanks to a nuclear power station restarting next week and the warmer weather. Market close data has revealed that the 1-year forward price for both commercial gas and commercial electricity dropped slightly - closing at 68.01ppt and £52.18/MWh respectively. This can be seen in the graph below. Note: Brent Crude prices are taken from opening market data, and do not represent the price as it changes throughout the day. Brent prices hit a low of 96.75 $/b in the morning but bounced back to close at 99.13 $/b, Brent timespreads fell significantly in the afternoon and gasoil cracks became weaker once again. The gasoil stocks fell by 4.6% as a result of increased demand in Germany although Platts are reporting that demand and trading activity was thin yesterday.